Earlier this year Capcom announced the eagerly awaited sixth installment of its popular role-playing game series would be an online game for mobile and PC. Fans were angry. Will fresh information and screens of Breath of Fire 6: Guardians of the White Dragon make them happy? Oh come on, it's got Nina in it. I can understand why fans of a series that's been console-centric for ages would be riled by the transition to online, likely free-to-play (though no pay structure has been announced yet) mobile game. Years of structure are being tossed out. But there is hope! According to fresh information on the official Japanese website for the game obtained via the fine folks at Pixelitis, there'll be some familiar faces and place in the game to help ease the pain. 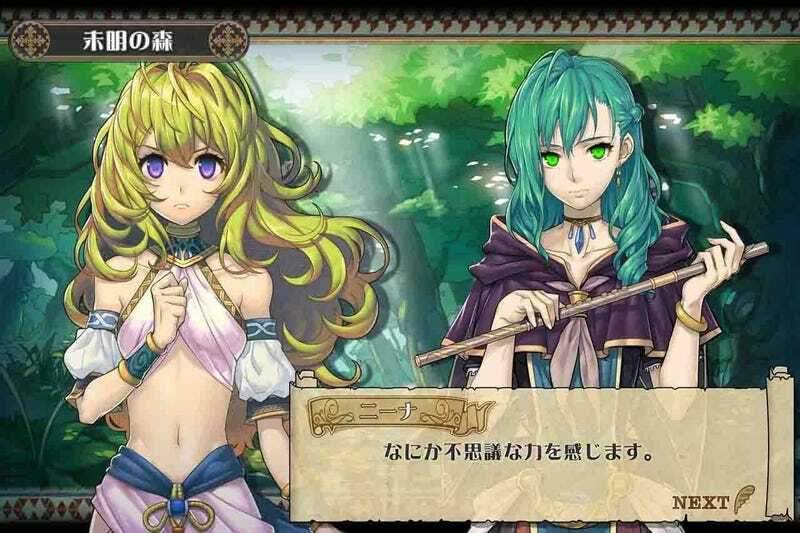 For instance, the blonde on the left here is Nina, descendant of the Wing Clan. She's not quite as birdlike as she's been in the past, but she's still our little Nina, mostly. Next to Nina is Peridot, a mysterious new character who rescues the main character from Not-Ryu's hometown of Dragnier, after its been ransacked by the Schwarz Empire. See? Familiar! Yes, there's no main character named Ryu — just a customized sprite hero that's unique to the player. But these customized heroes do start off in Ryu's hometown, and they do possess magical dragon-like abilities. Additional party members, once fully fleshed-out beings are being replaced with AI followers who fight by the created hero's side via time-based action combat. I could see Capcom turning this into a collectible card game variant, with players collecting followers based on rarity, spending money on chances to win more powerful allies. Oh wait, I am supposed to be reassuring fans. Look, town building! Looks a little bit too free-to-play mobile for me, but at least the feature is making it in. Okay, the situation still looks bleak, but all is not lost. We don't know if this will be free-to-play. We don't know if Capcom is going to pound away at players with microtransactions. Maybe Breath of Fire 6: Guardians of the White Dragon will be a game worthy of the Breath of Fire name, finally proving that a mobile transition doesn't have to be a bad thing. Maybe not. We'll find out this spring.